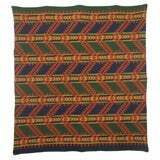 Navajo Indian saddle blanket weaving pillows in browns and geometric patterns. These two different pillows are in great condition and have tan cotton linen backings. Measures: 37 x 18 larger pillow 37 x 17 smaller pillow. Beautiful Vintage textiles made into new pillows. 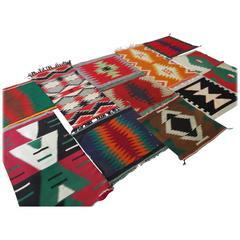 Navajo Indian weaving saddle blanket pillows in great condition. These simple stripes are quite interesting and folky. The backing is in black cotton linen. Turkish striped plain weave blanket with tasselled edging.